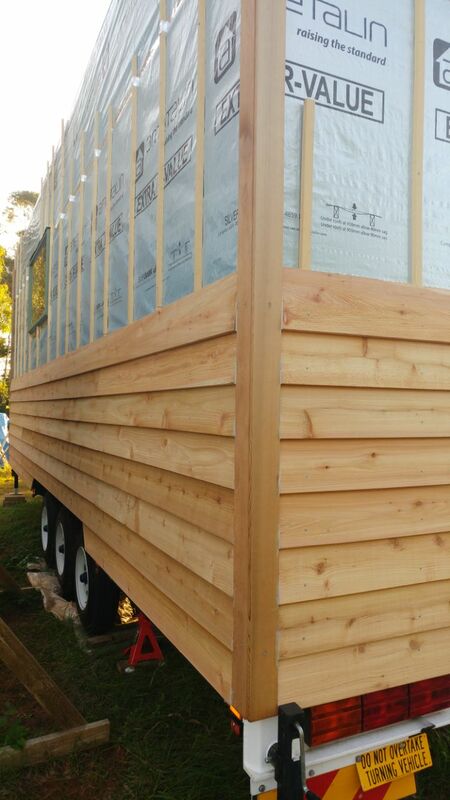 The cedar siding for our tiny house has arrived. 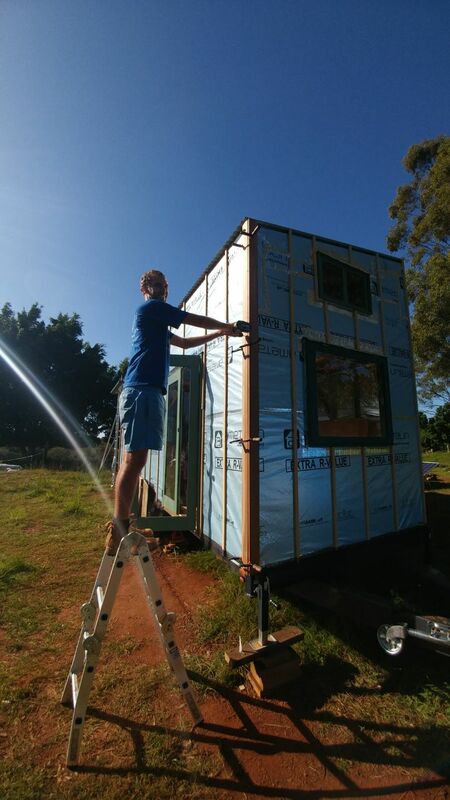 Last weekend we started to put the weatherboards on. They look amazing and totally transformed our frame. 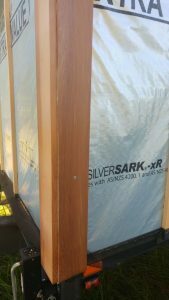 In the following article, I will explain our method on how to install cedar siding. With the windows and our french door installed, we’re now focused on getting our cedar siding on. 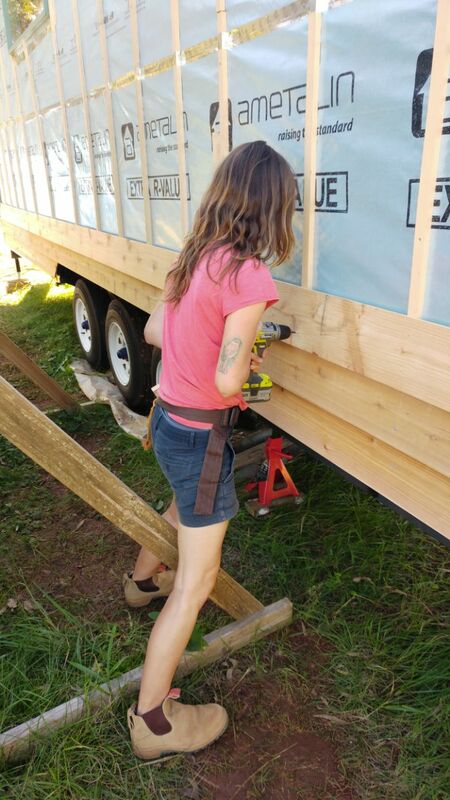 This is a very exciting new chapter in our tiny house build because once we’re finished, our frame will look like an actual tiny house on wheels!! When it comes to the cedar siding, we kept it reasonably simple. We decided on cedar cladding quite early in our planning phase. Because we have to watch our weight, like always, we wanted a lightweight wood. Cedar seems to be perfect for the job. The planks are very lightweight, look pretty, and they smell amazing! 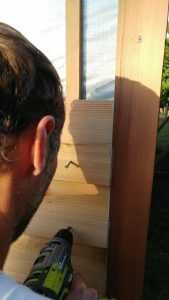 Installing cedar siding is fairly straight forward. The most important thing is to get the initial alignment right. This means that the first row of planks has to be precisely level and aligned with trailer. In our case, we made sure that our trailer is level first. Our build site is a bit wonky and not very even. So we put our trailer on jacks and made sure that it is level. 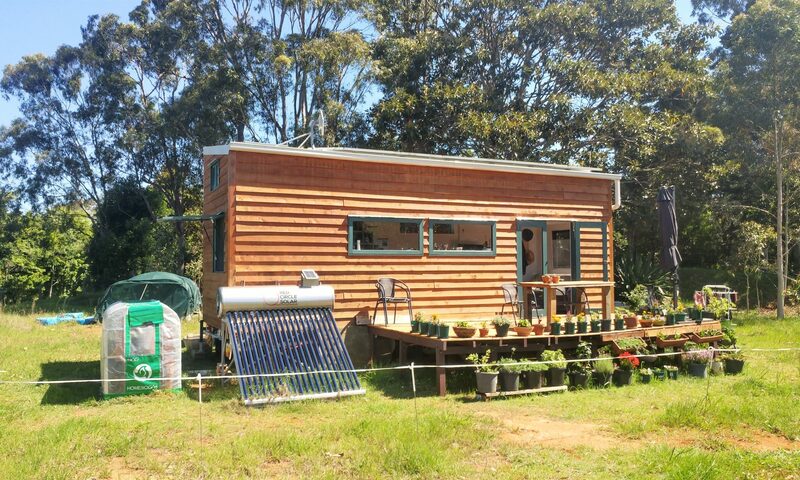 Then we aligned our weatherboards to our trailer. This method seems to work for us. This is something a bit out of the ordinary and I’m almost certain that this is not common practice. But we stapled a strip of mosquito mesh along the four sides of our trailer. We then stapled the other end of the mesh on the bottom side of our weatherboards before bolting them on. We hope that this will keep insects and other critters out and to prevent them from crawling between siding and building wrap. 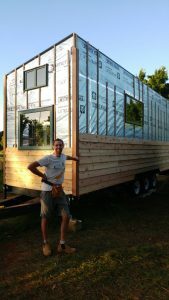 I’m not sure how effective this is but we saw another couple from Canada do something similar with their tiny house. Before installing our cedar siding, we installed the corner boards. Usually, it seems to be the other way around. 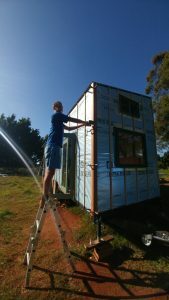 Tiny house builders seem to install the weatherboards first and then the corner boards. But we followed another builders recommendation who advised us to bolt on the corner boards first and to use them as a guide for the weather boards. This works really well for us. Because we can make sure the weather boards are flush and aligned before installing them. Also, we don’t exceed our maximum width of 2,5 m.
In order to make sure that we’re installing our weatherboards with the same distance apart, Paul made two nifty little jigs. The method is simple. We’re putting the jigs against the weatherboard and placing the new board on top of the jig. That way the jigs are holding the weatherboard and we can ensure that the distance between them is always the same. Genius!! This is another little trick to keep track of your available boards and to avoid wastage. We wrote down the different lengths of our boards. 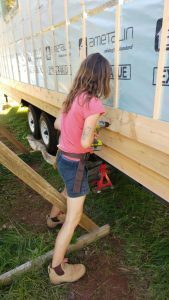 And then measured the different lengths we need to cover each side of the trailer, as well as, the distances between corners and windows. Then we calculated which boards to use for all the different sides and distances. This does take a while, no doubt. But it’s well worth it because, in the end, you will get the maximum use out of your boards. And your wastage will be very little. This is pretty much it. We’ve been applying the same techniques on all four sides. So far, this seems to work pretty well for us. Also, we’re using countersunk metal screws to screw them to our metal frame. 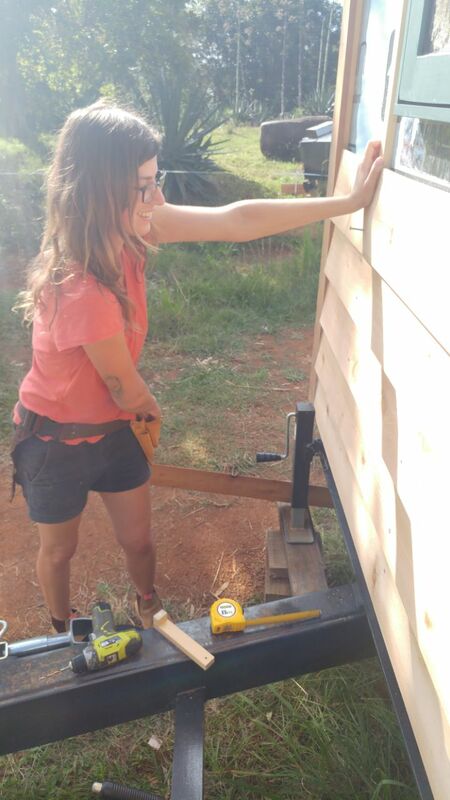 I can’t wait to see our tiny house with the finished cedar siding. This will be such a grand moment. Next PostNext Our tiny house is all boxed in!